Google+ organizes your social contacts in "Circles," an intuitive paradigm taken from the real world. You have circles of family members, coworkers, bar buddies, hobby enthusiasts, etc. When you add a contact to Google+ you can easily assign that person to a Circle. Default Circles are provided for Family, Friends, Acquaintances, and Followers, but you can change those labels and add other Circles. What is neat about Circles is that they give you much better control of what you share and with whom than Facebook does. When you add a comment, photo, or other item to your Google+ page, you can assign an access level to it. Only contacts in Circles with corresponding access levels can see that item. What users see in their "streams" (which are similar to Facebook's News Feed) depends on what Circles they're in. So you can share last weekend's party pictures with Friends while Family remain oblivious to your carryings-on. Users do not know what Circles you have assigned them to. 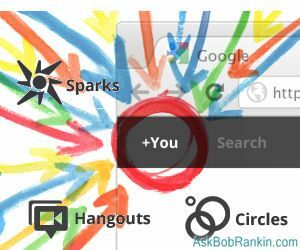 "Sparks" is a Google+ feature designed to spark conversations. It uses Google search technology to help you list interests and share them. Enter "Shakespeare" into the Sparks window, for instance, and you get a list of links to related Web pages. Click a link to add it to your stream. Click another button to save that search among your Interests for others to see. "Hangouts" is the Google+ video chat system. Hangouts could be the key to Google+ success, at least among younger people. No appointments are necessary; just "hang out" and see who drops by to join you. It's free, unlike Skype's $4.49 to $8.99 per month service. Up to 10 users can share a video chat room simultaneously. Being a browser-based service, Hangouts does not require any software installation and does not care what operating system you use. Video chat is supplemented by Huddle, a group instant messaging service. Will Google+ Dominate Social Media? Google has released an Android app for Google+ and promises an iPhone app in the future. For now, though, iPhone users have only Web-based access to their streams, photos, Circles, and profiles. Does Google+ have any hope of displacing Facebook as king of the social network mountain? Judging by the overwhelming demand for invitations to Google+ it seems possible. Many users are fed up with Facebook's complexity, privacy and security concerns, and the company's claims to own all users' uploaded data. Remember what happened to MySpace when the Facebook alternative came along. If Google+ can be kept simple and straightforward, and privacy issues are kept to a minimum, it will certainly appeal to many disaffected Facebook members. In order to try Google+, visit the Google+ Project page. You'll probably see the message that "Google+ is in limited Field Trial" and you'll need to click the "Keep Me Posted" button and wait for an invite. Even if a friend sends you an invite, you may not be able to login yet. But it shouldn't be long before they open it up to the general public. Most recent comments on "Will Google+ Kill Facebook?" Sounds like an interesting alternative. The idea of circles is smart. It is, as you say, like real life. The one thing that I would like to see added is the possibility of copy-protection on pictures, so people could look at pictures in your albums, without being able to take copies. This would stop redistribution of private material. I am hearing about Google+ for the first time. Face book has to work now to continue to occupy a prime place in our social interaction. I have no doubt that Google+ is going to generate huge fellowship. And with Google's past history regarding privacy issues, people think this is a cool idea? I haven't tried Google+ yet (no invite), but I know the key features that I WANT to see there, and which would induce me to switch if they were present. First, a service ethic; Facebook's user interface is dismissive. If it isn't in the Help system, too bad - there's no way to communicate directly with Facebook staff, even on a one-way basis. Second: privacy and respect for users' intellectual property; that means no claim of ownership of the user's data, and no use of that data without the user's explicit permission. Third: security; I have just had the experience of somebody hijacking my Facebook account and posting an announcement of a p**n/snuff video on my friends' wall in my name. Many others have had the same thing done to them. I do not, repeat, do not give out my password to anyone...period, so it isn't "user error" or falling for a phishing email. Somebody has a back door into Facebook, and Facebook seems to be ignoring it. Anyway, I know I'm probably dreaming here, but if Google were to credibly address those three concerns I would move to Google+ along with as many of my friends as I could induce to follow me there. Bob Rankin observes, "Does Google+ have any hope of displacing Facebook... it seems possible. Many users are fed up with Facebook's complexity, privacy and security concerns, and the company's claims to own all users' uploaded data." Facebook is a continuous tangle of privacy concerns. While these may not end with Google+, they probably will diminish considerably because of the essential Google+ difference-- the product was actually designed for discreet publishing of personal connections. In contrast, an increasing number have begun to turn away from Facebook because it was never designed to do more than one thing-- publish to marketers our private relationships. Those marketers made Mark Zuckerberg $13.4 BILLION richer, and he surely is crippled by remorse all the way to the bank about our privacy problems with Facebook. Many have been reluctant to use Facebook because of its loyalty to marketers over Facebook users. Google+ promises to be more attentive to user concerns, and depending on what they find, may decide to try Google+. The great irony is Google made its fortune as a non-intrusive service to marketers, but Facebook is all set to lose its popularity (and assets)-- all because it placed its allegiance with marketers, and alienated users. Had Facebook become known over its development for assiduous attention to privacy, Facebook might have a more assured future. Hmm, Google+ does sound like a good alternative. I for one hardly use facebook anymore. ever since I found out about the privacy issues it invokes, I have been reluctant to use it. If Google+were address those privacy concerns and actually attempt to eradicate them, then I would move to Google+ I especially like the idea of Circles; it does seems alot like real life. Thanks for your information about IT, Internet, Gadgets, security and all and all.